LAKE PLACID, N.Y. -- Oscar Klefbom said he's watched Edmonton Oilers games the past two years and thought about what it would be like to skate with their growing list of young stars. He just isn't ready to join them -- yet. Klefbom, taken by the Oilers with the 19th pick of the 2011 NHL Draft, told NHL.com on Friday his intention is to honor the final season of his contract with Farjestad in the Swedish Elite League and join the Oilers for the 2013-14 season. The 6-foot-3, 204-pound blueliner said nothing is set in stone, but said feels he needs another season of development before coming to the NHL. "It's been a long discussion," Klefbom said. "Edmonton wants me to come over and try but I don't want to come over and feel like I'm not ready. I think Farjestad is a really good opportunity for me to be a really good player." The Oilers are building around young, talented high-end forwards Jordan Eberle, Taylor Hall, Ryan Nugent-Hopkins and 2012 No. 1 pick Nail Yakupov. Now they need to find the same franchise building blocks on the back end, and Klefbom certainly has the look of someone who can fill that role. "Oscar is a big, strong, real good first-pass guy -- a real good defender too," Oilers director of player development Mike Sillinger told the team's website. "The importance of having and developing good, young, solid defense for our team is crucial. ... Oscar has a chance to be a big-time prospect with us. He had a pretty good year in the Swedish Elite League and I think playing with men has been a positive thing, so it will be interesting to see how he adjusts to the North American style when he comes over." However, Klefbom said that time to cover over isn't quite here. As tantalizing as the prospect might be to skate with so much talent around him, Klefbom said waiting another season could be for the best. "It's so exciting," he said. "Maybe in one or two years you're going to play with these superstars -- Taylor Hall and Ryan Nugent-Hopkins and Nail Yakupov. It's a big thrill for me. I want to come over, but I don't want to feel like I'm not ready when I come over. It's real big step for me." Sillinger clearly has the same vision of Klefbom moving the puck around the point while waiting for Hall, Nugent-Hopkins, Eberle and Yakupov to get into scoring spots. As much fun as that would be to see, he's also willing to wait for Klefbom. "There's no question if I had my personal preference, I'd want Oscar playing over here in the North American game," he said. "But I understand why he's staying in Sweden and he should still get some great development opportunities." 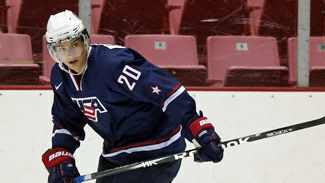 One of those opportunities will be a shot at a second-straight gold medal at the 2013 World Junior Championship. He had a goal and an assist in four games at the USA Hockey National Junior Evaluation Camp here this week, and the goal he scored was a memorable one. With Sweden skating with a two-man advantage midway through the second period of Friday's game against Finland, Klefbom skated into a drop pass at the top of the right circle and unleashed a slap shot that was as much heard as seen. "He has been all over me that he should be on the power play, and now he showed me why," Sweden coach Roger Ronnberg told NHL.com. Klefbom had two goals in 33 games with Farjestad last season, but could he be ready to start generating a bit more offense? "It just happened," he said of his goal. "We'll see. Maybe I play power play in the next tournament." Whether he plays on the extra-man unit or not, one thing he'll certainly have at the next tournament is the team captaincy. "He is the true leader for the guys," Ronnberg said. "I see it in every way. He's not just the chosen leader from me. He's the players' leader." Klefbom said he relishes the chance to wear the "C," and sees it as a tremendous honor -- and motivator. "I like the responsibility to be captain," he said. "I know all the guys. I have lots of respect for them and they respect me as a captain. I think that's a positive thing for me, it brings me energy. I like it." Having gone through the tournament last year -- Klefbom was one of six players at this week's Evaluation Camp who won the gold medal at the 2012 WJC -- Klefbom said he learned how narrow the margin is between winning and losing, and how important it is to keep focus on every shift in every game. "In the [WJC] every guy is so skilled, so every mistake you make, they punish you," he said. "You have to play with big confidence and you have to believe in yourself. Every guy is so skilled here. When we played against Russia in the finals it was such a small difference between every guy. You have to stay focused every time. One bad period can make a whole tournament go away. "Every shift, every single time you're on the ice, you have to be at 100 percent or you get punished." Klefbom and his teammates did that last year and came home with the nation's first WJC gold medal in 31 years. Despite photos of last year's championship celebration festooning the team's locker room in Lake Placid, Klefbom said they've tried to put those golden memories in the past and shifted the focus to what Ronnberg called "a new journey." "We have left it behind us," Klefbom said of last year. "Of course there's good motivation to have those pictures in the locker room, but we have to put that behind us and go for another gold instead of saying, well, we have a gold. We want to take it again. We have to be prepared for the next gold." And after they try for that gold, he'll go back to thinking about Edmonton and the possibilities that lie there. "Definitely next year," Klefbom said of playing in Edmonton.